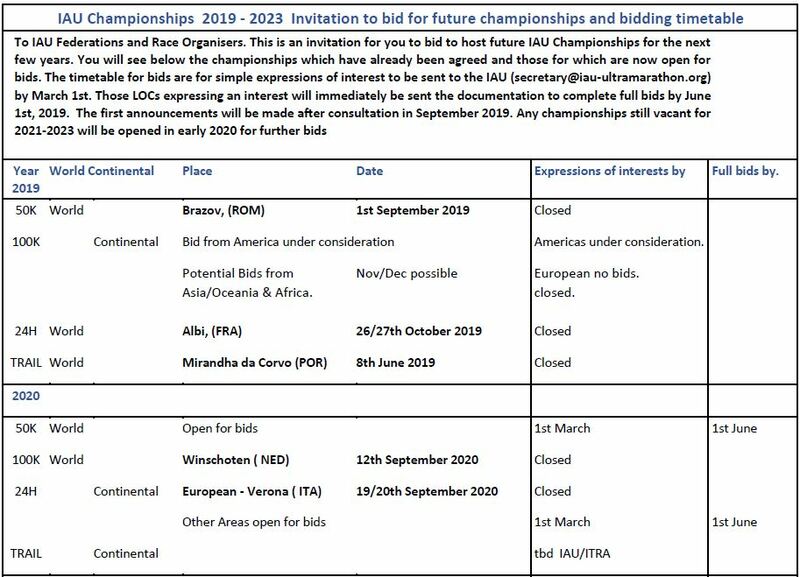 I am pleased to share our timetable for bids for the next IAU Championships 2020 - 2023. I hope that you, together with your race directors, would like to consider applying to host one of our future championships. Holding our championships would show case your country as well as the sport. The first stage would be simply to send notice of "expression of interest" to myself as general secretary (secretary@iau-ultramarathon.org) giving the information about likely venue and partners such as the LOC and race direction for the specific championship. The deadline for this will be March 1st 2019. You will be immediately sent the full bidding documentation which needs to be completed by June 1st 2019. There would be consideration and dialogue over the summer and it would be hoped that first decisions would be made by the end of September 2019. Any championship still vacant for 2021-2023 will be opened in early 2020 for further bids. Below you can find updated tables from 2019 up to 2023.